If the UK can attract manufacturers onto its soil, industry experts predict that between now and 2020 45,000 to 70,000 jobs will be created. Offshore wind turbines look to be the next big market in the UK. If the UK can attract manufacturers onto its soil, industry experts predict that between now and 2020 45,000 to 70,000 jobs will be created. By 2050 the government believes 200,000 jobs could result from the renewable energy boom. The UK has to prove that it is an attractive location for a manufacturing plant by building a skilled workforce and providing favourable government incentives. More research is also required to improve deployment methods for offshore turbines to make the process safer and more efficient. In face of the challenges, the UK seems to be on the right track to fulfilling these requirements. Discussions are taking place between the UK's government and potential investors. Siemens Wind Power seems to be the front-runner, but Clipper Wind Power and Mitsubishi Heavy Industries are also thought to be taking place in discussions. These companies are all actively seeking to expand their business. Mitsubishi Heavy Industries is currently exploring a new turbine manufacturing plant in the US, while Siemens is building more partnerships. Clipper Wind is set to build the world's largest wind turbine ever in Norway. The UK will face challenges from more established locations. But investment is beginning to flow for the UK's wind energy sector. Mabey Bridge announced plans to build a £38 turbine manufacturing plant in Chepstow, South Wales. The factory should create 240 skilled jobs and help a manufacturing revival in Wales. 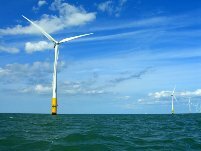 In addition, the Energy Technologies Institute (ETI) and UK government are joining together to build the world's largest open access offshore wind turbine test facility in Blyth, Northumberland. This will attract more companies to test and build in the UK. These measures seem to put the UK on an aggressive path towards securing its own wind turbine factories. The question is whether private investment will come fast enough. The offshore wind power plants will be built in the North Sea and Irish Sea and could generate a quarter of the UK's power.